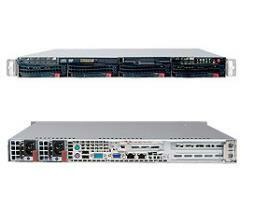 1U rackmount server. Single Quad-core/Six-core Opteron®, Up to 64GB DDR3 memory, SATA/SAS RAID, 4 hot-swap HDD bays, dual Gigabit LAN, 1 of PCI-e x8 slots, IPMI management, 300W high efficiency Power Supply. 3U rackmount storage JBOD box. 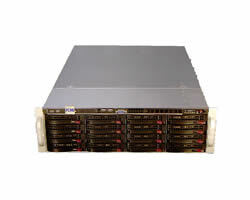 4-channel SAS interface, 16 hot-swap bays for SAS or SATA HDDs, 700W Redundant high efficiency Power Supply. Transfer rate: 3GB per SAS channel. 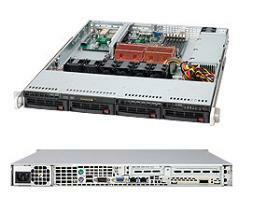 1U support dual 8/12 cores Opteron® 6100, up to 256G DDR3 memory, SATA2 RAID, 4 hot-swap HDD bays, dual Gigabit LAN, 2 of PCI-e x8 slots, IPMI management, 720W high efficiency Power Supply. 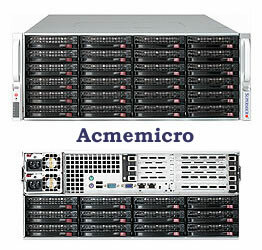 Dual 8-core/12-core Opteron 6100 4U Rackmount storage server. 16 slots up to 64G DDR3, 36 of 3.5" SATA/SAS hot-swap HDD bays, include 3ware SAS RAID controller. Redundant 1400W Power Supply. Intel, the Intel logo, Xeon, and Xeon Inside are trademarks or registered trademarks of Intel Corporation.